New, Refurbished, Restored & Upgraded. Now Supplying NEW CREATE. Products inc. Rotators & Antennas etc on Request. 13 ITEMS LISTED FOR SALE BELOW, PLEASE SCROLL DOWN. WANTED - ROTATORS ETC - DEAD OR ALIVE. I ALSO SERVICE, REPAIR, REFURBISH & UPGRADE YOUR ROTATORS. Rotators, Controllers & Hardware below are COLOUR CODED. NEW & NOS (New Old Stock). Fully Refurbished, Restored, Repaired & Upgraded etc. Basic Refurbishment, Serviced & Repaired etc. Deceased Estate & 2nd Hand etc. Also there is information on the work that was done to each item. In addition they have a 12, 24 or 36 month limited warranty on the work that was undertaken. Please read warranty disclaimer below. 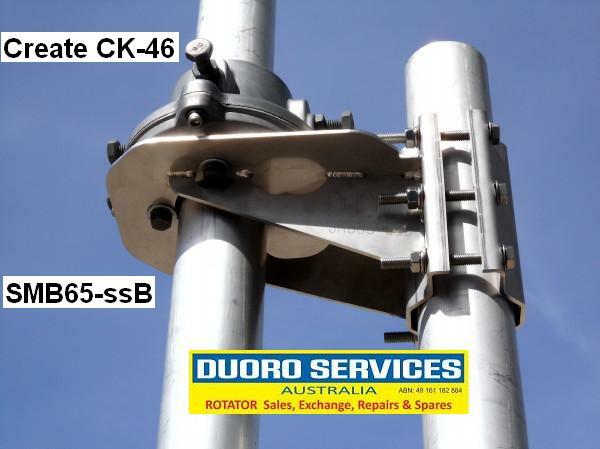 PURCHASE & INSTALL TWO (2) CREATE CK-46 MAST BEARING ABOVE ANY ROTATOR PURCHASED BELOW I WILL DOUBLE THE LISTED WARRANTY (ie 36 month to 72 month). Disclaimer :- Photo proof of proper approved installation must be provided to activate the warranty extension. (Qty 1) (FOR SALE) $159.00 AUD. NOS Mast clamp set in very good condition, for the CompuTator CT-1000 rotator. Includes 4 x M10 X 75mm stainless steel clamping bolts. 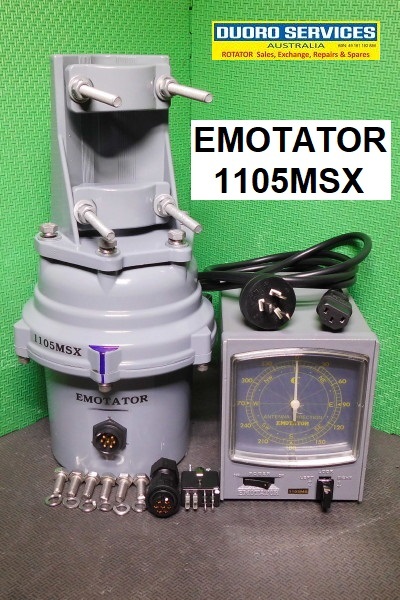 The CompuTator rotator is very rare, not much much info is out there on them & they are a completely different design on the inside, so to find a mast clamp set in this condition is even rarer. 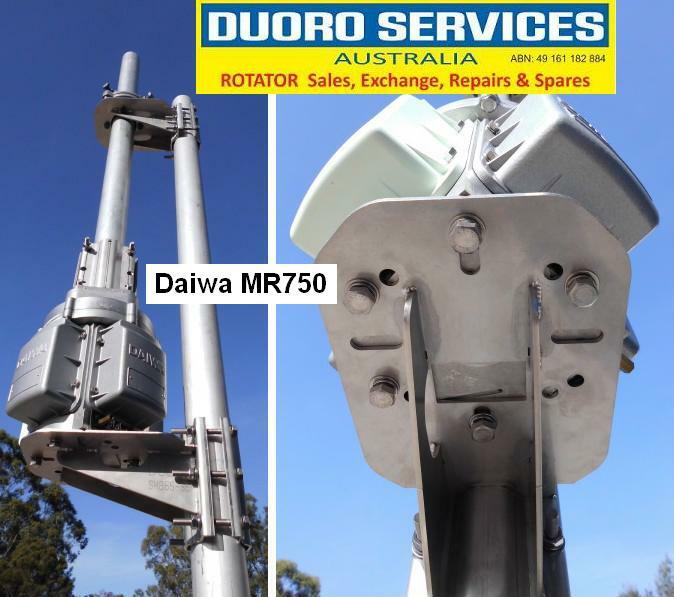 If you have never seen or heard of these rotators, have a look @ one I repaired, refurbished & upgraded for a customer on the DUORO Customer Gallery page. (Qty 3) (FOR SALE) $130.00 AUD each. "NEW" Mast Bearing for above rotators. The CK-46 is a revolutionary new type of mast (thrust) bearing, that is a brake away from the standard notions of the past. Advanced engineering plastic technology for the bearings & magnesium alloy die-cast are used for the housings respectively, & also galvanized high tension bolts are used as the hardware, that assures high intensity & strength, anti-corrosion features of the mast bearing. The grasping method for the mast is chuck type (instead of bolts ends type) that adapts the same structures used in the lathe machine, enables a strong grasping force to the mast, that results in no bolt end damage to the mast, meaning aluminium mast can be used with the CK-46, with peace of mind. Acceptable mast diameter:- ..................40 ~ 65mm. Mounting:-................................................4 x M8 bolts @ 85 mm diameter. (Qty 0) (sold out) $ AUD. Basic Refurbishment. These bearing have been used, But are in good condition. Completely striped down & cleaned etc then reassembled with new grease. NEW. Made from 3mm Stainless Steel. Minimum of two brackets needed, sold individually. (Qty 1) (FOR SALE) $275.00 AUD each bracket. (Qty 0) (SOLD) more soon $275.00 AUD each bracket. 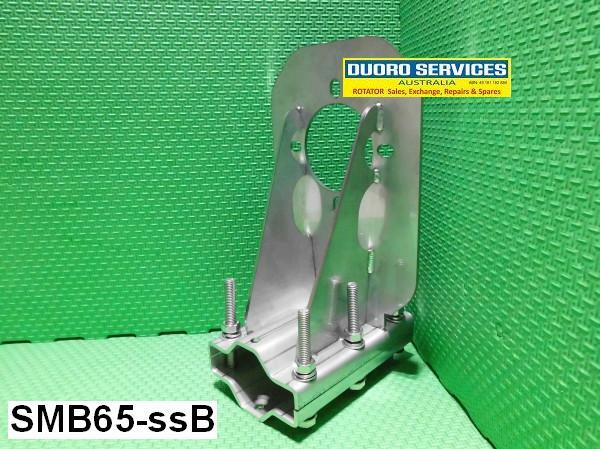 NEW PRODUCT Side Mount Brackets, SMB65ssR for the rotator & SMB65ssB for mast thrust bearing. 50 to 68mm diameter round tube. 65 to 68 mm SQUARE tube, (using longer bolts). 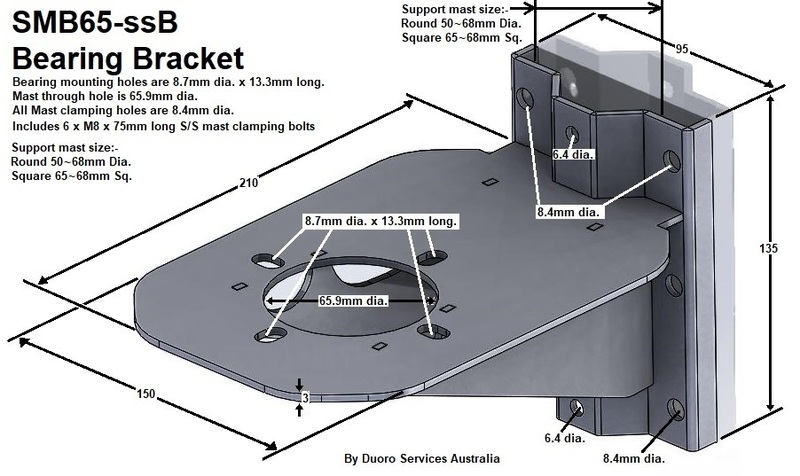 Flat surface 100mm plus width, (using screws or bolts). 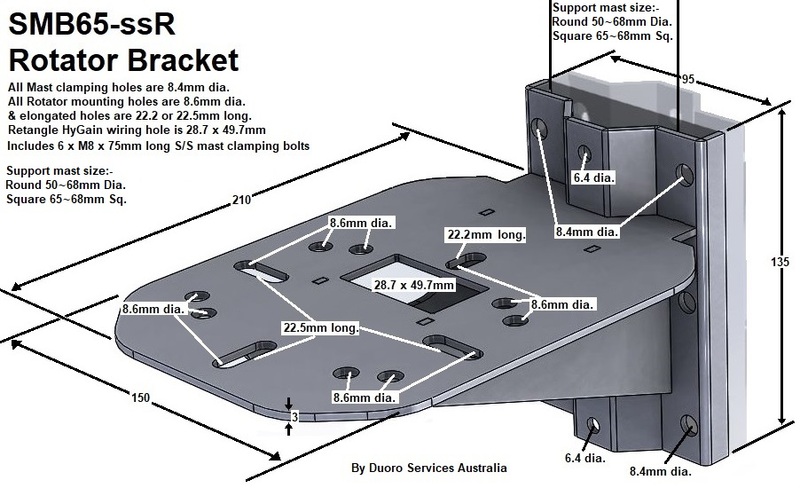 Each bracket is made from 3mm Stainless Steel, Laser cut, computer folded & welded by MICRO Manufacturing in Australia, supplied with backing plate & 6 x 65mm M8 S/S hex set screws, nuts & washers. 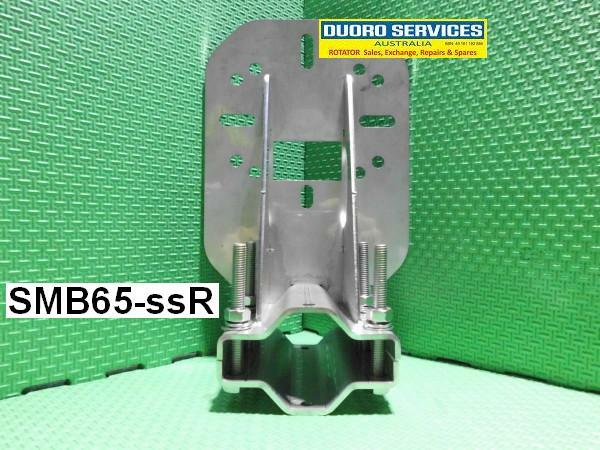 A minimum of two brackets (1x SMB65ssB & 1x SMB65ssR) are needed, for added rotator protection a second SMB65ssB can be used. 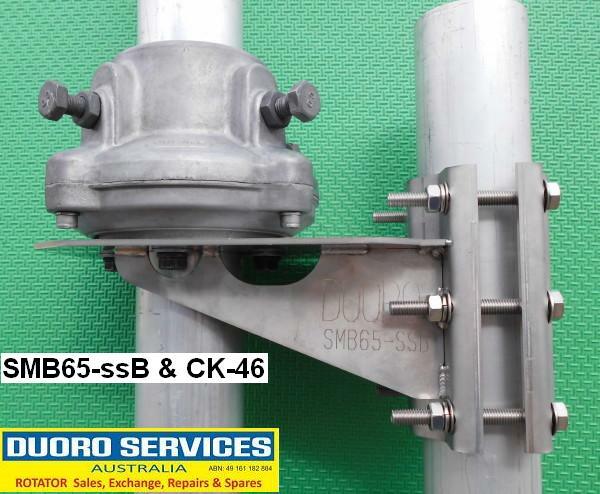 SMB65ssB is for the large Mast Thrush Bearings from Create CK46 & Yaesu GS-65 for pipe mast size 50 to 65mm dia. 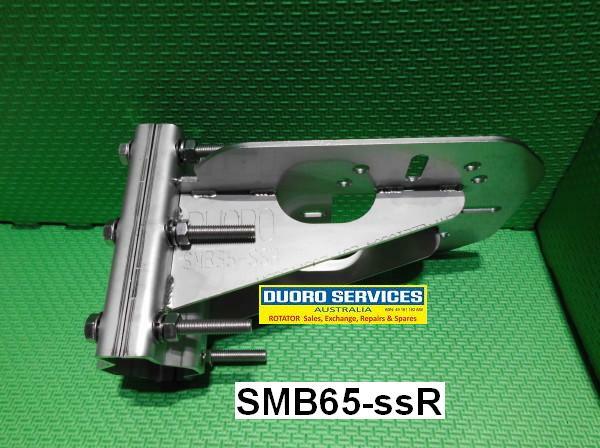 SMB65ssR is for most rotators with a 4, 5 or 6 mounting bolt pattern including CREATE RC5 series, DAIWA DR7500/7600 & MR750/300/400, EMOTATOR 105 through to 1300, Hy-Gain/CDE All Ham series + T2X, KENPRO KR-400/450XL through to KR2700 & HR1300, PST 641 + 2051, YAESU G-400/450 through to G-2800 etc. These new versions have longer gussets (165mm) with more lock tabs & spanner holes to make it easier to do up bolts etc. 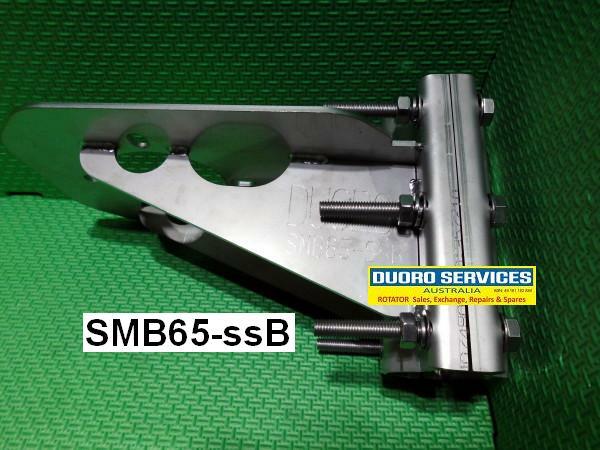 SMB65ssB now has a larger mast hole (66mm) & the gusset are on a angle to miss this hole. 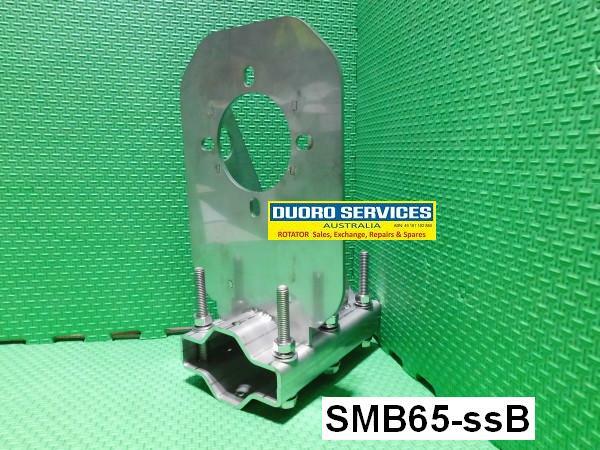 SMB65ssR now is wider (150mm) to accommodate the PST 2051 plus the mounting holes have been adjusted. 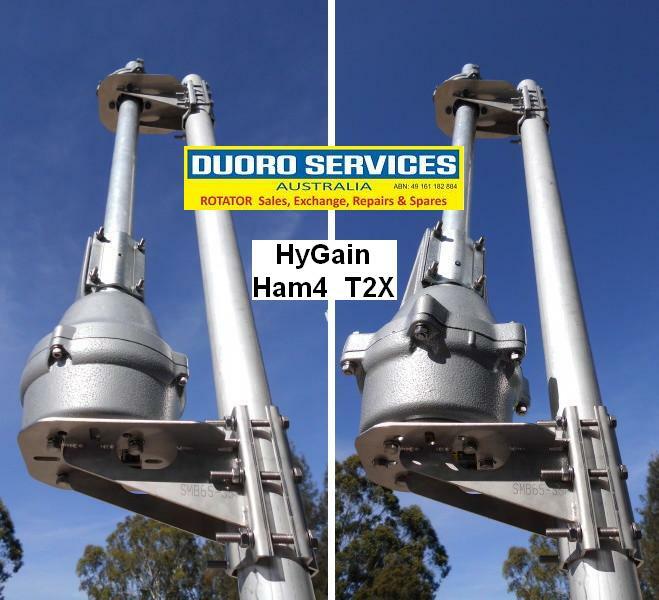 Added new mounting holes & wiring entry for Hy-Gain / CDE Ham series & T2X rotators. T2X having all 6 mounting holes able to be used. Added feature :- The centre is now solid to protect Create Rotators, being all the weight of the mast etc is in the middle of the base of the rotator. Extra feature :- The adding of the bottom cable entry for Hy-Gain /CDE rotators mean rotator like PST with breather holes on the bottom, now have air flow. RC5-1 Rotator Set with dial speed control. (Qty 1) (FOR SALE) $1,050.00 Reduced $875.00 AUD. 12 month warranty (extendable to 36 moth for an extra $200.00). NEW Rotator & Controller Set :- In original box Includes:- Top mast clamp, Plug & terminals for control cable, GAL mounting & clamping hardware & Manual. Uses 7 core control cable not supplied & sold separately, please view cable available on the rotator spares page. Wind Area .............. 1.2 m sq. The -1 Controller :- NEW. Has variable dial speed control (75 to 110 seconds for 360 degrees) & has a full circle compass display with a single on-off-on manual direction paddle switch. The RC5 Rotator :- NEW. Has 1/60 worm drive into two stage reduction gearing, all driven by a high torque 28v AC motor. Able to rotate a full 380 degrees. It has low back lash with high rotation torque & powerful braking without relying on any auxiliary brake mechanism. With a total of only four gears, two of which are made from high tensile steel & the other two are made from zinc alloy, all running on high tensile steel shafts. 230 vAC. 12 month warranty (extendable to 36 moth for an extra $200.00). RC5-3P Rotator Set with dial pre-set & remote control. (Qty 1) (FOR SALE) $1,400.00 ea Reduced $975.00 AUD each. NEW Rotator & Controller Set :- In original box Includes:- Top mast clamp, Plug & terminals for control cable, GAL mounting & clamping hardware & Manual. Uses 7 core control cable not supplied & sold separately, please view cable available on the rotator spares page. 12 month warranty (extendable to 36 month for an extra $200.00). The -3P Controller :- NEW. Has variable dial speed & dial pre-set control + remote computer control via DIN socket on the rear panel with a switch for remote or local. Rotation time is 75 ~ 110 seconds for 360 degrees) & has a full circle compass display with a single on-off-on manual direction paddle switch. 230 vAC. 12 month warranty (extendable to 36 month for an extra $200.00). RC5A-1 Rotator & Standard Dial Speed Controller. (Qty 0) (SOLD) $ AUD. Includes NEW top mast clamp & H/W + NEW plug for control cable. Wind Area .............. 2.5 m sq. The -1 Controller :- Has dial speed control with lock direction switch. Completely stripped down & cleaned. Installed NEW output terminal block. Upgraded the PCB with IC & transistor sockets to make repairs easier. Has be fully checked & aligned with the rotator below. The RC5A Rotator :- Has 1/60 worm drive into two stage reduction gearing, all driven by a high torque 28v AC motor. Has been completely stripped down & cleaned. Has been refurbished & upgraded with NEW parts. Refurbished the POT & replaced 'Z' bracket with new, Replaced the limit switches & mount with new. Since the rotator didn't a top mast clamp when I purchased it, I use a new set that I had in stock. The housings, output flange & the new mast clamps were glass bead blasted, etched primed the finished of Epoxy Gloss enamel (Pewter). Aligned & calibrated with the controller. 230 VAC. 24 month warranty. This Unit is available For Exchange. CLICK For Details. Panel Metered version Controller & HAM3 rotator with top mast clamp hardware & manual. Wind Area .............. 1.4m Sq. The Std Panel Metered Controller:- Serviced etc:- This controller has 3 control switches 2 for direction (CCW & CW) & 1 for the brake. There is NO brake delay or any other upgrades in this controller (unlike the other controllers listed on this site). The original 110v transformers were replaced with genuine 220v original versions. Has been cleaned, aligned & tested, The original power plug was replaced with a new approved safety version. Supplied with copy of manual. The HAM3 Rotator :- Has a friction brake in the motor & a solenoid brake system. This rotator has been striped down to the last nut,bolt & screw, then cleaned & had a basic service etc. The motor was stripped down & the friction brake was repaired etc , then bolted back together. Some metal parts inside have been painted. Shimmed & aligned the gearing then installed into there sub chassis with new grease. The solenoid brake wedge system was reassembled with some replacement used good condition 2nd hand parts & installed into the brake chassis. The POT was replaced with an upgraded version I had in stock, also installed ferrit beads. Installed new ball bearings & reassembled with new grease through out. The housings are as I got them painted in grey with a bit of black. Includes top mast clamp & mounting hardware. This Rotator Set was available for exchange. CLICK for details. CDE HAM2 Rotator & Controller. Refurbished & Upgraded with NEW parts. (Qty 1) (FOR SALE) $750.00 AUD. CLICK TO View the Auto Brake video on YouTube. Includes top mast clamp, plugs for control cable & IEC power lead + revised manual. Wind Area .............. 1.16m Sq. The HAM2 Controller :- Refurbished & upgraded to dual action direction switches (No more holding down the brake switch + the direction switch) + upgraded to 7 core control cable. Completely disassembled for mods & upgrades including removing the rear panel. Upgrades:- New BDS-35 Auto brake & delay PCB, Converted from 3 lever action to dual action two levers including 4 new micro switches, Replaced the rear panel with a laser cut & etched stainless steel panel with NEW fused IEC & Cinch sockets + new CAL/NORM switch & earth bolt, added LED modual for meter illumination & installed there power supply onto the main PCB, Replaced the original paper direction display with an Aluminium one from a Kenpro, added 3 LED's for brake & direction action, Replaced the two transformers with a single 240v multi taped Australian made version, New illuminated power switch & CAL POT. Fully re-wired, aligned & calibrated to the rotator. Includes IEC power lead & Cinch plug. The HAM2 Rotator :- This rotator has been upgraded with a friction brake in the motor plus it has a solenoid brake system. This rotator was rebuild with NEW & re-zinc plated parts, (inc top housing & brake chassis, mast clamps & S/S hardware, Top gear plate, CAP, POT, gearing, Bearings & retainers, Cinch socket & plug, hardware etc. The motor was stripped down & the friction brake was repaired with new cork pads. The Solenoid brake assembly is good condition with new hardware. Upgrades :- Control cable is now 7 core (instead of 8 core), by way of moving the motor start CAP to the rotator which used Pin's 4 & 8, then separating the motor & solenoid 0v on Pin 1, too the motor now using Pin 4, Repair & upgraded the friction brake on the motor. Installed NEW direction POT, Replaced screw terminal with Cinch socket & cover plate, mounted the motor start CAP, Added a (protection/safety) micro switch for the motor's 0v which is activated by the wedge latch (if the brake wedge does not release the motor will not go), Mast bracket upgraded my NEW Stainless Steel version with new Stainless Steel 'U' bolts. Housings were glass bead blasted, etched primed then finished grey enamel. Shimmed & aligned the gearing, replaced the bearings & retainers, then reassembled with new grease through out. Re-wired, Aligned & Calibrated with the controller. This Rotator Set is available for exchange. CLICK for details. Refurbished & Upgraded with a lot of NEW parts. (Qty 1) (FOR SALE) $995.00 AUD. Wind Area ............... 1.8m Sq. The CR4HG Controller:- Full circle display with momentary & lock direction switch. The controller formally a Daiwa CR-4 was completely striped down, reconfigured & full upgraded to work with the HyGain T2X rotator. Upgrades:- Replaced the display PCB with one from a Emotator controller which was upgraded + a Emotator 8 volt transformer, Installed my BDS-35 Auto brake release & delay PCB, Replaced original 9 way screw terminal block with a NEW 7 way version from Create, Installed LED illumination & power supply, Fully re-wired & upgraded to 7 core control cable. The HyGain T2X Rotator:- Has a friction brake inside the motor + a solenoid activated brake wedge. This rotator was rebuild with about 95% NEW parts, (inc all housing & chassis, Motor, mast clamps, Limit Switches Assembly, POT, Ring Gear, Bearings & retainers, Cinch socket & plug, hardware etc. The Solenoid brake assembly was from a display unit a purchased & in very good condition. Upgrades :- Control cable is now 7 core (instead of 8 core), by way of moving the motor start CAP to the rotator which used Pin's 4 & 8, the NEW wiring configuration uses the now vacant terminal 4. Installed NEW direction POT, Replaced screw terminal with Cinch socket & cover plate, mounted the motor start CAP, Added a (protection/safety) micro switch for the motor's 0v which is activated by the wedge latch (if the brake wedge does not release the motor will not go), Mast clamp bracket upgraded to my NEW Stainless Steel version with new S/S 'U' bolts. Housings are as I got them from HyGain, natural aluminium, as this rebuild was becoming way to expensive to do a proper paint job on them. Shimmed & aligned the gearing, replaced the bearings & retainers, then reassembled with new grease through out. Re-wired, Aligned & Calibrated with the controller. (Qty 1) (FOR SALE) $200.00 AUD. Basic Refurbishment, Stripped down cleaned & serviced. Upgraded meter illumination with LED's . Replaced cracked gear in the direction indicator drive train. Added heat sink to voltage regulator on PCB. Changed the AC primary tapping on the transformer from 100v to 230v. Replaced power cable with an approved safety version, re-wired to the switch & fuse. 230v AC. 12 month warranty. Choose A Controller To Go With The DR-7600 Rotator. Controller (2) DC-7001a Std controller. Controller (3) DC-7004 Pre-Set Controller. (Qty 1) (FOR SALE) $ 600.00 AUD. To View more pic of this rotator & controller please go to VK classifieds Dealer section. Rotator with your choice of controller, Refurbished & Upgraded. Includes Top Clamping Mast Clamp, Plugs For Control Cable & IEC power lead. Fully striped down & cleaned etc. The (4 stack loose) final drive gears were replaced with a soild one piece version (KD-38T), this gives more contact area onto the rare ring gear. Refurbished the POT, replaced the limit switches, install a round 7pin IP67 socket mounted on a S/S cover plate. The housings & mast clamps were Glass Bead Blasted then etched primed followed by painting in Epoxy Gloss Enamel Pewter paint.Reassembled with new ball bearings & new grease through out. Aligned & calibrated to the controller of your choice. Supplied with 7 pin IP67 plug & S/S mounting /clamping hardware. (1) The DC-7011 :-Std manual controller, Refurbished & upgraded etc. Fully striped down & cleaned, refurbished the POT, added LED display illumination & install there power supply PCB, replaced the alignment POT with 10 turn version, Replaced AC fuse clips with fully sealed safety fuse holder, Replaced the flat blade screws of the output terminal with S/S Philips screws, Replaced power plug with with an approved safety side entry version. (2) The DC-7001a :- Std manual controller. Refurbished & upgraded etc. Fully striped down & cleaned, refurbished & repaired the POT + drive display gear train, Install illuminated push button direction & power switches, installed LED display illumination & install there power supply onto the main PCB, replaced the alignment POT with 10 turn version, Installed fused IEC power socket to the rear panel also installed earth bolts, The output terminal was striped down & cleaned the the screw terminals were replaced with later versions. The housings were glass bead blasted the under coated followed by painting with epoxy enamel hammer tone grey. Supplied with IEC power lead. (3) The DC-7004 :- Manual & Dial Pre-Set controller. refurbished & upgraded etc. Fully stripped down & cleaned. The top & bottom casings were Glass Bead Blasted, primed then sprayed painted in Satin black followed by a few coats of clear. Upgrades & repairs:- Removed the motor start CAP then rewired to work with later model rotator's (DR-7500 & DR7600) that have the motor start CAP inside, Replaced the old display illumination with 2 x 3 LED modules & installed there power supply onto the main PCB, also updated the compass display, The PCB had two of it's primary POT's upgraded to 10 turn versions to make setting up easier, Replaced cracked gears on the display drive with new, Refurbished both 500 ohm wire wound POT's, Stripped down the terminal board (rotator output) cleaned & sprayed in clear paint then reassembled with replacement Phillip screw terminals, Installed a fused IEC socket & rewired to switch & transformer, added two earth bolts which double as the mountings for the transformer which now have strengthening blocks + add two support post fro the transformer to rest on, all 2.5mm screws were upgraded to 3mm. inc newly written & illustrated manual including schematic (as non are available) Supplied with new IEC power lead. 220v AC. 12 month warranty. (Qty 1) (FOR SALE) $500.00 REDUCED NOW $400.00 AUD. 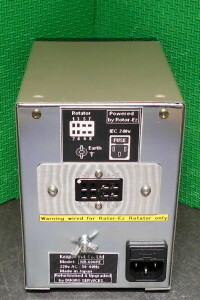 Rotator with Standard full circle controller, Refurbished & Upgraded. Includes MC1212 Top Mast Clamp, Plugs For Control Cable & IEC power lead. Warranty...................12 month (extendable to 24 month for an extra $100.00). The TSX Controller:- Full circle display with momentary & lift to lock direction switch. Disassembled, cleaned & prep chassis for upgrades & new parts. The Back Panel:- Installed a new 8 pin Cinch socket & laser cut S/S cover/mounting plate, New fused IEC 240v socket & earth bolt with wing nut. On The Inside:- Upgraded the display illumination with 2 x 3 LED modules & there power supply, replaced the direction display. Re-assembled, fully tested & aligned with the rotator. The 105 Rotator :- Has a 24v AC motor & a lift disc brake mounted on top of the motor. Disassembled to the last nut, bolt & screw. Cleaned & checked all parts for damage. All housing & the mast clamp assembly have been Glass Bead Blasted by IMPACT GLASS BEAD followed by painting in clear Epoxy Enamel. The stainless steel 'U' bolt's & hardware were cleaned in a special solution. Replaced the original control cable terminal & cover with a Amphenol LTW IP67 7 pin round socket mounted on a laser cut S/S plate. Replaced the limit switches & the POT was refurbished. The gears were aligned & shimmed then re-assembled into the refurbished housings with new bearings & new grease through out. Re-aligned & calibrated with the controller. 240v AC, 12 month warranty (extenable to 24month for an extra $100.00). (Qty 1) (FOR SALE) $600.00 REDUCED NOW $500.00 AUD. Includes Top Triple Clamping Mast Clamp, Plugs For Control Cable & IEC power lead. On The Inside:- Upgraded the display illumination with 2 x 3 LED modules & there power supply. Re-assembled, fully tested & aligned with the rotator. The 502 Rotator :- Has a drag spring brake system mounted on top of the motor. All housing have been Striped Cleaned by REDI-STRIP then Glass Bead Blasted by IMPACT GLASS BEAD followed by Etch priming & finished of in silver hammer tone paint. Since this rotator didn't have any mast clamps when I purchased it, I used a set I had in stock that was striped cleaned & powder coated Silver ripple. Replaced the original control cable plug/socket & cover with a IP67 7 pin round socket mounted on a laser cut S/S plate. The burnt out 100v AC motor was replaced with a 24v AC version with new new motor start CAP, the limit switches were replaced & the POT was refurbished. The following metal parts were re-zinc plated:- Top gear plate, Motor mounting plate, Limit switch mount & Z bracket & POT divider gear. 240v AC, 12 month warranty. (Qty 1) (FOR SALE) $500.00 AUD. Includes MC1213 self centering top mast clamp, plugs for control cable + revised manual. Wind Area ............... 2.5m Sq. Rotation Time ......... 80 seconds 360 degrees. Rotator Voltage ...... 100v AC. The MXX Controller :- Panel metered display with dual action direction & brake switches. The Back Panel:- Replaced original hard to get plug/socket with new Male 8 pin Cinch chassis socket & 8 pin F/M Cinch plug. On The Inside:- Installed a NEW Australian made 240v in - 100v output transformer Upgraded the display illumination with 2 x 3 LED modules & there power supply. The 1102 Rotator :- Has twin wedge solenoid activated brake system. All housing & mast clamps have been Glass Bead Blasted then etch primed followed by painting in silver epoxy gloss enamel. Limit switches were replaced & the POT/gearing was refurbished. Solenoid brake system re-assembled with some re-zinc plated parts. The gears were aligned & shimmed then re-assembled into there sub chassis, then re-assembled into the refurbished housings with new bearings & new grease through out. The mast clamp is Emotators's MC1213 triple self centering version. This unit is be available for exchange. Click for DETAILS. The MSX Controller:- Full circle display with momentary & lift to lock direction switch. The Back Panel:- Installed a new 8 pin Cinch socket & laser cut S/S cover/mounting plate, New fused IEC 240v socket & earth bolt. On The Inside:- Upgraded the display illumination with 2 x 3 LED modules & there power supply. Refurbished the display POT & installed a new display drive belt. The 1105 Rotator :- Has twin solid final drive gears & a BK spring brake system. All housing have been Cleaned then Glass Bead Blasted by IMPACT GLASS BEAD followed by Etch priming & finished off in Pewter epoxy enamel paint. Replaced the original (hard to get) control cable plug/socket with Amphenol LTW IP67 7 pin plug & socket. 240v AC, 24 month warranty. This unit was available for exchange. Click for DETAILS. (Qty 0) (SOLD, another one soon ) $ AUD. Rotator & Dual Speed Standard Controller, Refurbished & Upgraded. Includes Top mast clamp, Plugs for control cable & revised manual. The DS Controller:- Has been upgraded to low/high Dual Speed configuration in the direction switch. The direction switches are in two stages, first low speed then high. The high speed direction switch can be held or locked in position. Completely disassembled, cleaned & prepared chassis for new upgrade parts. The Back Panel:- Installed a 8 pin Cinch chassis socket onto a laser cut S/S cover/mounting plate, also installed a new fused IEC socket & earth bolt with wing nut. On the inside:- Upgraded display illumination with 2 x 3 LED modules & the power supply. Upgraded the display compass. The direction switch bar was replaced with a wider version to make contact with the new micro switches. The transformer was upgraded with an Australian made version. Also installed new low speed power module etc. 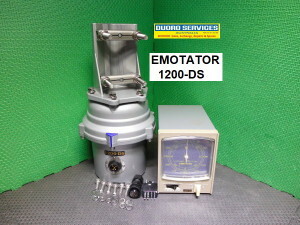 The 1200 Rotator:- Twin solid final drives onto housing, 24v DC High speed rotation. Completely disassembled & cleaned etc, checked all parts for damage. All gears are in very good condition & only needed to be aligned & shimmed. Replaced the original control cable socket with a new 5 pin IP67 version. The housings & mast clamp were Glass Bead Blasted, etch primed followed by silver hammer tone paint. Reassembled with new bearing & new grease through out. Re-aligned & calibrated with the controller. 240v AC. 12 month warranty. AR-1002 Rotator & DC-7010 Controller. (Qty 0) (SOLD, another one soon) $ AUD. Rotator with top & bottom mast clamps. Wind Area ............... 0.25 m sq. The Control cable is now 6 core, sold separately, view on Rotator Spares page. 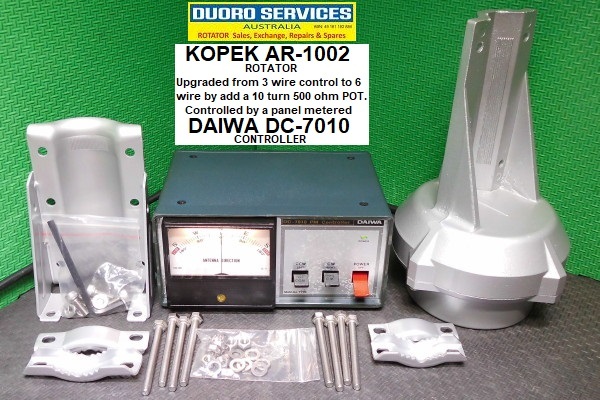 The KOPEK AR-1002 Roitator :- Refurbished & Upgraded. I Purchased this rotator without a controller & since I don't like 3 wire controlled rotators, I upgraded it to potentiometer controlled ie 6 wire. Completely strip & cleaned, then installed upgrades. All the housings & mast clamp etc were glass bead blasted then primed followed by several coats of enamel silver paint then finished off in enamel clear. Upgrades:- Installed a 10 turn Potentiometer & POT drive gear, re-wired to 6 wire control, Aligned gears, replaced the ball bearing & reassembled with new grease. Aligned & calibrated with the replacement Daiwa controller. The DAIWA DC-7010 Panel metered Controller:- Refurbished & Upgraded. I purchased this controller with the panel meter installed, it was a bit rough so I completely striped it down, cleaned & tidied it up. I replaced the wiring mess & home made PCB with a cut down Kenpro KR-400 PCB which was upgraded with the power supply for the LED display illumination & power LED. Replaced the bulky meter adjustment POT with the standard Kenpro POT mounted on a Z mount which was mounted on the inside the casing. Installed meter illumination using a 6 LED strip module, also painted the inside edgers of the lens in black. Striped & cleaned the output terminal board, sprayed painted in clear & replaced the screw terminals. Also installed a chassis mounted fuse holder & earth bolt. Calibrated & aligned with the KOPEK rotator. Control cable is 7 core. Does not come with cable. I do have HD 7 core cable available see rotator spares page. Wind Area ............... 1.0 m sq. The Std Panel Metered Controller :-Basic Refurbishment. Cleaned & checked operation etc. Installed new 240v safety plug..
Re-calibrated & aligned with rotator. 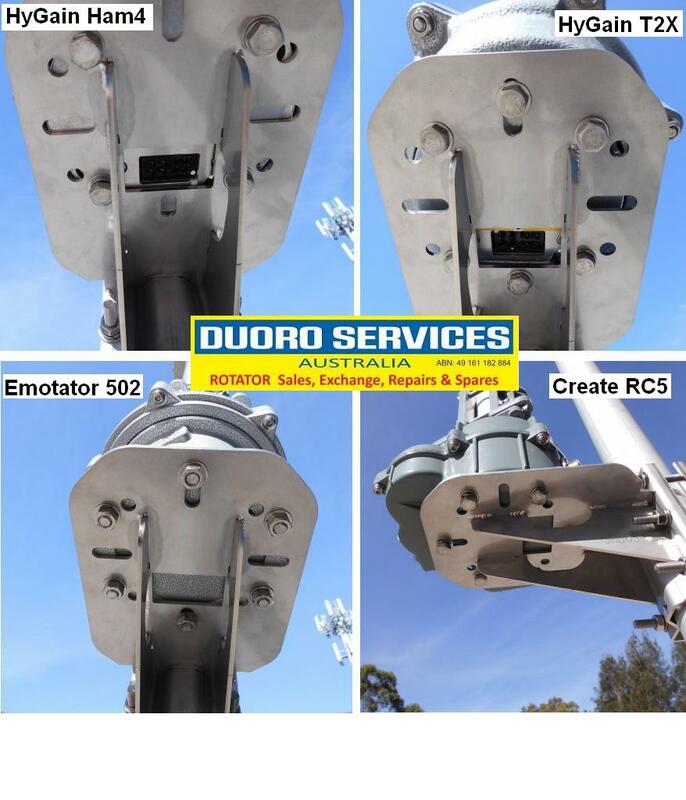 The KR-400 Rotator :- Basic Refurbishment & Upgrade, with replacement mast clamps. Completely disassembled, cleaned & checked all parts for damage etc. Upgraded the 3 stack final drive gears with (KR-600) 4 stack gears & bush, this gives more contact area onto ring gear& lesson the chance of damage to the hard to get ring gear. Replace the ball bearings. Housings are in original paint in good condition. This rotator didn't have a top mast clamp when I purchased it, so I used a refurbished set I had in stock, that had be glass bead blasted then etch primed followed by painting in silver enamel. Re-assembled with new grease through out. Re-aligned & calibrated to the controller. Supplied with new Stainless steel clamping & mounting hardware. Restored, Refurbished & Upgraded etc. Standard Controller with Rotor-Ez (Pre-Set) kit fitted & Rotator with top mast clamps + revised manual & plugs for control cable. Fully Restored, Refurbished & Upgraded etc. Rotor-Ez by Ham Supply (idiom Press) is a replacement PCB with a microprocessor on board. Some of the features available:- Dial Pre-Set, 5 second brake delay in manual & Pre-Set modes, 3 degree shut-off & coast to Pre-Set, Electronic end stops with 5 degrees shut-off, Colour changing Status LED & more. Some of the above features have been disabled for the KR-600RE. (Control cable not supplied) cable is 6 core but 5 core can be used if you don't want to have LED limit end stop feed back from the rotator. See Rotator Spares Page for 7 core control cable. Wind Area ............... 1.5 m sq. The RE Controller with Rotor-Ez:- Rebuilt, Restored & Upgraded etc. Completely disassembled then cleaned, upgraded & installed the Rotor-Ez PCB. The original transformer was replaced with two 240v versions. Upgraded meter illumination with LED's & there power supply mount on the Rotor-Ez PCB. On the front panel a new laser cut & etched stainless steel label was added. The power switch was replaced with a push on/off switch which includes the the Dial Pre-Set POT. 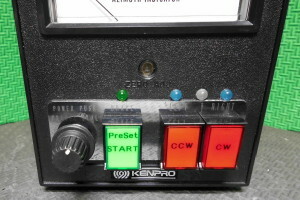 The two original direction switches were replaced with illuminated red square momentary push button switch + added a third illuminated green square momentary push button switch for Pre-Set START operation. Also installed, two blue LED's for CW/CCW direction + a bi-colour LED for STATUS & a red LED (mounted inside the meter) for limit feed back from the rotator. 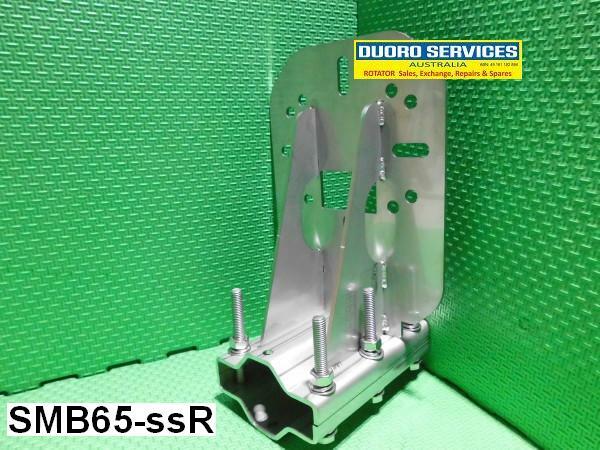 On the rear panel:- The sub chassis was cleaned & zinc plated, replaced the screw terminal strip with a 8 pin Cinch socket mounted on a laser cut & etched cover/mounting plate. Also installed, a fused IEC socket & earth bolt with wing nut. Fully re-wired, Re-aligned & calibrated with the rotator. New IEC power lead & Cinch plug supplied. 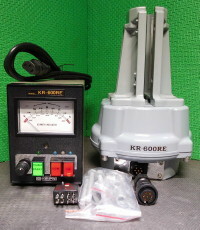 The KR-600 Rotator:- Rebuilt, Restored & Upgraded etc. Completely disassembled, cleaned & checked all parts for damage etc. Housings & mast clamps have been Glass Bead Blasted then etched primied followed by painting in Epoxy Gloss Enamel (Pewter). Replaced the 4 stack final drive gear with a one piece gear (KD-38T) that was made for me. The KD-38T will not track groove into the rare ring gear. The KD-38T has more contact area with the ring gear, meaning less damage to the rare ring gear. The two limit switched & ball bearing were replaced with new. 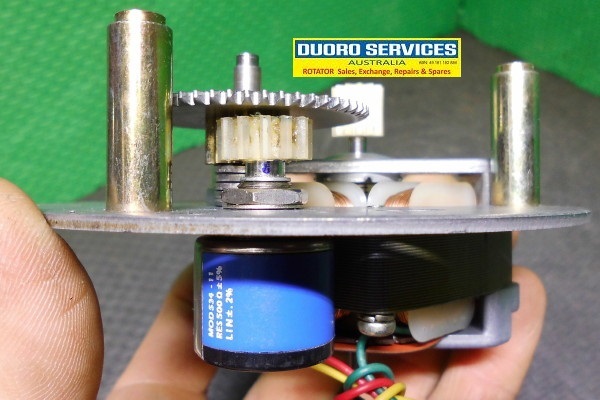 The motor start capacitor was moved from the controller to the rotator. Replaced the screw terminal strip with a IP67 7 pin chassis socket mounted on a laser cut stainless steel cover/mounting plate. Fully re-wired including re-configured wiring lay-out to suit Rotor-Ez. Reassembled with new grease through out. Re-aligned & calibrated to the controller. New stainless steel mounting/clamping hardware & IP67 7 pin plug supplied. (Qty 0) (SOLD) $0.00 AUD. Full Circle Controller & Rotator with top mast clamps + manual. Control cable is 5 core. Does not come with cable. I do have HD 5 core cable available see rotator spares page. Wind Area ............... 2.0 m sq. The Full Circle Controller :-Basic Refurbishment & Upgraded. Replaced old globe illumination with 3 x LED strip & installed there power supply PCB . 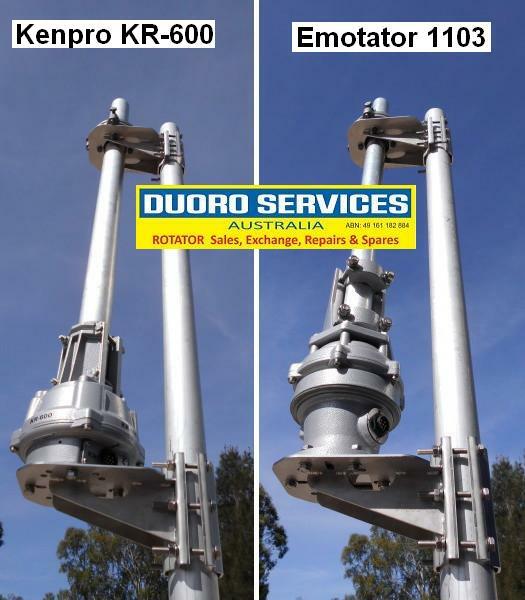 The KR-800 Rotator :- Basic Refurbishment & comes with replacement mast clamps. Completely disassembled, cleaned & checked all parts for damage etc. Replace the ball bearings. Housings are in original paint in good condition. The original mast clamps were missing when I did the traded-in/exchange, so I used a 2nd hand set (from a Yaesu) I had in stock that are in good condition. Re-assembled with new grease through out. Re-aligned & calibrated to the controller. Supplied with clamping & mounting hardware. KR-2000RC with BDS-35 Auto Brake Delay. RC Controller with BDS-35 brake delay kit fitted & Rotator with top mast clamps + revised manual & plugs for control cable. Refurbished & Upgraded etc. Control cable is now 7 core instead of 8 core, which mean you can use 7 core trailer cable which is easier to get. Wind Area ............... 2.5 m sq. The RC Controller :- Full circle display with BDS-35 brake delay PCB added & upgraded to illuminated push button switches for Power, Brake & Direction. Completely disassembled & cleaned, then installed upgrades. Upgraded meter illumination with a 3 LED module & there power supply. On the front panel all switches were upgraded to illuminated push button versions, two x red push on-off for the power & manual brake over ride & 2 x green momentary for direction also install a red LED for brake action. On the inside:- Added a BDS-35 automatic brake delay PCB & rewired brake & direction switches. 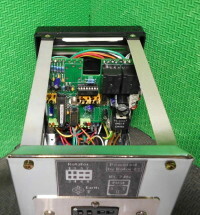 The BDS-35 PCB is controller by the direction switches & gives 3 or 5 second delay to the solenoid brake system before engaging the brake, you can over ride auto brake delay by press the manual brake button. Moved the motor start CAP to the rotator. On the rear panel:- Replaced the screw terminal strip with a 8 pin Cinch socket mounted in a laser cut S/S cover/mounting plate, also installed a fused IEC socket & earth bllt with wing nut. Fully re-wired, realigned & calibrated with rotator. Supplied with a new IEC power lead & Cinch plug. The KR-2000 Rotator :- with solenoid wedge brake system. Completely disassembled, cleaned & checked all parts for damage etc. The ring gears bearing track was re-ground as it was very rough. The housings were Glass Bead Blasted then etched primed followed by painting in hammer tone Gun metal. Since this rotator did not have any mast clamps when I purchased it, new GC-048 6 bolt set I had in stock was used. Installed the motor start CAP from the controller & replaced the four micro switches then fully re-wired. Refurbished the POT, replaced the cracked POT drive gear & sleeved the shaft housing. Install a IP67 7 pin round socket for the control cable. Fixed the loose gear shafts & install new larger bushes, shimmed & aligned gears. Re-assembled gear/wedge chassis with new grease then re-install into the refurbished housing. Replaced the ball bearing & re- assembled with new grease through out. Re-aligned & calibrated with the controller. Supplied with new GAL & S/S hardware & 7 pin IP67 plug for the control cable. G-5500 Dual Axis Controller only. Basic Refurbishment & clean up. This model provides 450 degrees azimuth & 180 degrees elevation for AC rotators. Cleaned up & tested, in good condition. Includes manual. Warranty Disclaimer : - Not covered by warranty :- Any electrical surge, spike or static discharge man made or from lightning. Breakage from turning an antenna or array to big for the capacity of the rotator. Not using the manufactures correct size control cable. From severe weather of any kind. Tower/mast collapse or failure of any kind. Dropping, abuse or misuse of any kind. Continually rotating unit beyond the manufactures duty cycle. Not servicing, checking or maintaining unit. Duoro Services shall not be liable for any incidental or consequential damage caused by the failure or otherwise of the above products. Rotators & Controllers etc NEW, New Old Stock, Under Service, Repair, Rebuild, Refurbishing or Being Upgraded. DC-7011 Standard Round Controller only :- Rebuild, Restore & upgrade etc. Progress Report :- Fully stripped down & cleaned etc. Replaced cracked display drive gear + cleaned & aligned gearing. Replaced & upgraded display illumination with 2 x 3 LED modules + installed there power supply. Replaced old screw terminals with later version. Replaced twin core power lead with new 3 core version & 240v plug. DC-7055 Pre-Set Controller only :- Rebuild, Restore & Upgrade etc. 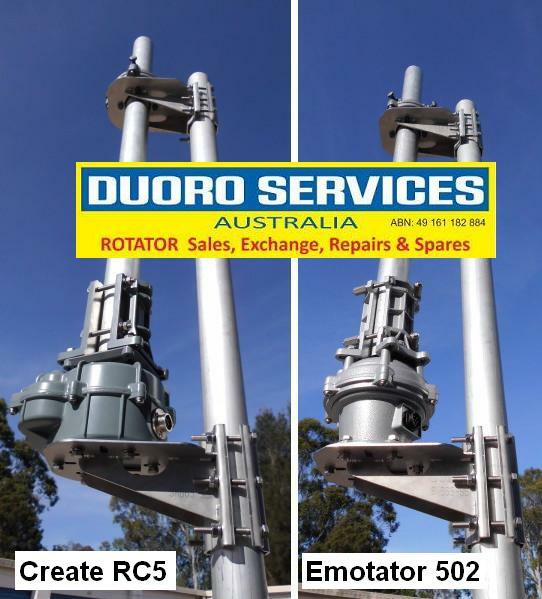 DR-7500a Rotator with top mast clamps :-Rebuild, Restore, Repair & Upgrade etc. Progress Report:- Fully stripped down to the last nut, bolt & screw then cleaned. Added limit switches & rewired + added new IP67 7 pin round socket & S/S mounting plate. Fixed brake disk. All gear was checked for damage, replaced the 3 stack final drive gear with KR-600 4 stack gear & bush then reassembled with new grease. NEEDS RING GEAR TO PROCEED. All housings & mast clamps have been striped cleaned by Redi-Strip & are now getting glass bead blasted by Impact Glass Beading & the powder coated. Progress Report:- Completely disassembled to the last nut bolt & screw. Rewired & added new IP67 round control cable socket & new S/S mounting plate. All gearing was checked for damage, replaced the 4 stack final drive gear with my NEW on piece version then reassembled with new grease. NEEDS RING GEAR TO PROCEED. All housings & mast clamps have been striped cleaned by Redi-Strip & are now getting glass bead blasted by Impact Glass Beading & then will be powder coated in clear . CR-4 standard Controller Only for MR-750 MR-300 & MR-400 rotators. Replacement controller:- Completely disassembled for upgrades & modes. Replaced old globe illumination with a LED module & installed it's power supply PCB. Replaced screw terminal strip with an off the shelf 8 pin Cinch socket mounted on a new laser cut & etched cover/mounting plate. Rotator with Top mast clamp. Rebuild, Restore & Upgrade etc.